I know I write a bit about the evils of homeowners associations, and in particular, the evils of Sand Lake Hills Homeowners Association, Inc. (SLHHOA). In my most recent installment, I would like to discuss the involvement of a couple people in the unwinding saga of SLHHOA and the process the board of directors had undertaken to rewrite the covenants and restrictions. Those people I would like to discuss are Paul McGarigal, "The Real Estate Coach," and the law firm of Larsen & Associates, which represents SLHHOA, as well as numerous other homeowners associations in the area. One may ask why I would be discussing a real estate agent and a law firm in relation to a homeowners association, but the point I will make is the inherent conflict of interest the two have with such a corporation, and how these two people's involvement illustrates that their actions, as well as the board of directors, have no interest in protecting the homeowner or their property rights, and are simply acting for their own benefit. For starters, I would like to look at Paul McGarigal. McGarigal is a real estate agent and property manager in Central Florida. He owns several homes, some of which are located in Sand Lake Hills, and he has worked closely with the SLHHOA in the past, such as donating thousands of dollars for landscaping projects, or sponsoring and writing articles for the association newsletter, but there is an underlying issue. While McGarigal tried to give the appearance that he was helping the community at large, one must also remember that he is a businessman, and businessmen don't just give away thousands of dollars, and real estate agents especially don't give away that kind of money for association landscaping projects unless there is something to gain from it. His participation with the SLHHOA newsletters gave excellent exposure for his business, with the newsletter reaching almost 900 homes. His landscaping endeavors were to go towards another goal - rewriting of the covenants and restrictions of the neighborhood. According to McGarigal's property management company, DANSCO, "Paul McGarigal participates in several homeowners associations," which in turn benefits his property management company, as well as real estate company, because he is familiar with the covenants and restrictions of the property, but also the associations as well, but here is the conflict of interest - as a real estate agent and property manager, you are in charge of your property, with other homes becoming variables in your business. When selling a home, the curb appeal of not only your client, but their neighbors as well, can effect the decision of possible buyers. To tie this loose end, McGarigal had found an interesting angle. Become involved in the homeowners associations in which he operates and attempt to create stricter rules and regulations, forcing the other non-client homeowners to shape up or ship out. Now, as a real estate agent, McGarigal can rig the system, controlling the appearance of properties he does not represent, and in theory, these homes that may not be up to his selling standards would be forced to fix their curb appeal, quite possibly raising the property value of the homes he does represent, translating into a larger commission for his business. From a business perspective, this sounds like a solid deal, but there is one group of people that gets left out - the average homeowner. Homeowners associations and real estate agents seem to be concerned with real estate prices. 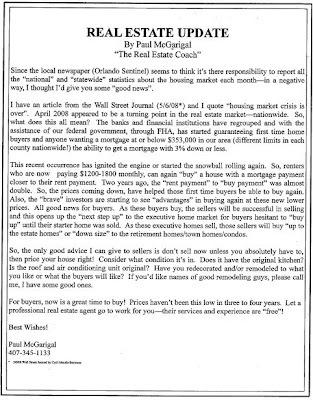 Numerous newsletters published by SLHHOA featured articles written by Paul McGarigal, as well as another resident/agent, Paula Kotzin. Paula Kotzin had taken her involvement a step further, and when the SLHHOA was kicked out of the local library, where they held their membership meetings, for refusing entry to homeowners who were not members to their corporation despite Florida law, Kotzin had offered the association use of her real estate offices for a private meeting. Currently, another real estate agent, Art Lopez, has gotten involved with the HOA, sitting on the board of directors. These real estate agents are not involved merely by coincidence. They are involved because they have an agenda, and that agenda is to sell homes, but if you consider the common theme of neighborhood associations of community cohesion, then you can see that the involvement of real estate agents and all this talk of property values only promotes the interests of those selling their homes and the investors who wish to buy those homes. For the homeowner who wants to live in their home and not sell, they must faced with an encroachment on their property rights and increased property values that will equal increased property taxes and insurance costs. Paul McGarigal does not see the homes in neighborhoods like Sand Lake Hills as a place for people to settle down and raise a family. He views these properties as "starter homes," where the homeowner must eventually "buy up" or down, depending on whether they want to progress to a real home move into something smaller, such as a condominium or retirement community. This process involves a real estate agent, and I am sure Paul knows a real good one. Researching Sand Lake Hills, there was something interesting I had come across. There was a corporation called the Dr. Phillips Preservation Association (DPPA) ten years ago, and SLHHOA was a charter member. I had never heard of such association and there was never any mention of it in any of the newsletters, so, I decided to look up the corporation's records. 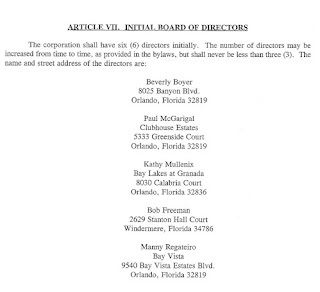 To my surprise, I found Paul McGarigal's name on the list of initial board of directors. Unfortunately, the articles of incorporation did not really state much, consisting of the minimum amount of information legally required, but I did find something else that was interesting, and that was the list of the other board members - all of whom were real estate agents and/or board members of various local homeowners associations (Bay Lakes, Bay Vista, Clubhouse Estates, Sandpointe). Further research uncovered that fellow Preservation board member Bethany Pendergast was involved in a messy recall lawsuit back in 2006, which coincidentally involved the same lawyer who is representing a current homeowner suing the SLHHOA. Take into consideration that SLHHOA was a charter member and you can start seeing the picture. While the corporate documents are void of any real information, considering who is involved and the fact that it has the word "preservation" in the title should say something about the goal of the company, which I believe the following article written by Paul McGarigal can further show intent of the organization, as well as the real estate agents, and the conflict of interest at hand. 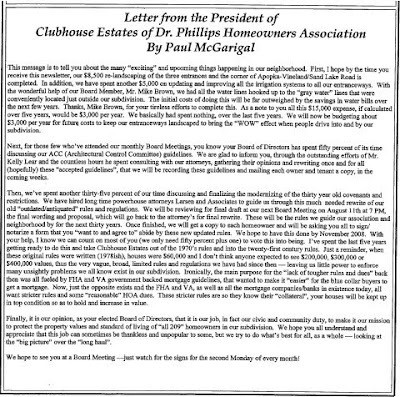 A Clubhouse Estates newsletter from 2008 (the same time SLHHOA started filing paperwork with the county amending their covenants) had a couple articles written by HOA president Paul McGarigal. In the first, McGarigal discusses the neighborhood's push to amend the covenants and restrictions, utilizing a "powerhouse" law firm, Larsen & Associates, to rewrite the existing documents for a set of stricter set of ones, as well as reasoning as to why the original covenants were just so vague, which according to him, the Federal Housing Administration and the Veteran's Association would not make home loans for properties in neighborhoods with mandatory associations, making it easier for blue collar workers to buy a home, but according to McGarigal, things have changed and lending institutions now prefer to loan money for neighborhoods with strict associations in place as a form of protection for their "collateral." Considering that I have read countless articles discussing lending institution's reluctance to lend to buyers seeking property within community associations, mainly because such properties have increased liabilities which can come in the form of association assessments. Banks simply do not want the added burden on their "collateral." Why make rewrite the covenants and restrictions? McGarigal makes the case that it is time to protect property values, stating that home prices have skyrocketed from $60,000 in "1978ish" to "$200,000, $300,000, or $400,000 values." As an investor, these figures would seem amazing until you put things into perspective. While the homes were originally purchased for $60,000, two things must be taken into consideration. One being inflation and the second being the housing boom (which McGarigal only touches upon briefly). Considering inflation between the original purchase of the home and the time McGarigal's articles were written, the value of $60,000 would be worth approximately $195,925.80 in 2008 (more then triple the value). The housing boom would have added to the value, but as McGarigal writes in his second article, citing The Wall Street Journal (5/6/8), the "housing market crisis is over," but as we all know now, the market has not rebounded, and property values had continued to fall for the next two years. Even insisting in July 2008 would be a bit premature considering the economy was hemorrhaging all over. Why would McGarigal promote the idea that the crisis was over? If you read his article, it is to sell houses. He discusses "buyers" and "sellers" and the best way to get most for your property, recommending renovation services, writing that he has "some good ones." This isn't a real estate update for homeowners who may be on the verge of losing everything because their house had rapidly devalued, this is an article for those who were scared to sell their homes, with McGarigal attempting to calm potential sellers into thinking then was a good time to put their house on the market. These articles were written in July of 2008. In the article, McGarigal states that he had spent the last five years getting ready to rewrite the covenants. That would put the origins of his desire to rewrite the covenants to the early 2000s, and that would also be around the waning days of the Dr. Phillips Preservation Association, which entered administrative dissolution in 2000, becoming inactive, but according to a SLHHOA document dating after 2001, mention of the DPPA was present. Also take into consideration that Kathy Mulinax was the President of local HOA Bay Lakes, which had also gone under a rewrite of their covenants, using the same "powerhouse" attorneys, Larsen & Associates. What I found to be the most troublesome is McGarigal's own words in which he states that he believes it is his "civic duty" to protect property values, most likely from the "unsightly problems" that pop up in communities over time. What McGarigal fails to realize is that these "unsightly problems" are other people's homes. Consider Sand Lake Hills and their quest to rid one homeowner of their metal roof, because the board deems it "unsightly" (I believe the word they used in the membership meeting that I had attended was "ugly"). As a board member and real estate agent, McGarigal wants that level of control so that he may try to ensure property values, and in his business, his bottom line. I would like to point out that with all the protection these HOA's claimed to offer, property values still plummeted the past several years, which goes to show that HOAs are also at the whim of the market. As a law firm, they seem to represent the interests of associations, not homeowners, so that should be the first indication who's interest they are looking out for. Now take into consideration that their senior Attorney, Frank A. Ruggieri, is also a Community Association Institute lobbyist, and is the founder of the Community Associations Institute's Mid Florida Chapter. The CAI is an influential special interest and lobbying group that represent associations and are for legislation granting community associations greater powers. They lobby local, state, and federal government on behalf of associations (not owners) and try to decrease government oversight. The CAI wants HOAs to have what they call "aesthetic control". They believe that a homeowners lifestyle impacts the economic value of a home and the HOA should have the power to prevent any non-conforming decisions. One example they mention are the infamous pink flamingos that may be found in some Florida lawns! They are against many of the laws established by the state that safeguard the homeowner... they feel these laws take away from the HOA's power granted to them by Covenants and Restrictions and negatively impact the value of homes. They want Federal Bankruptcy Codes to change allowing an HOA to collect on assessments. They do not care who gives them the money... they want the assessments to be an obligation of the property and they also want assessments to no longer be considered executory contracts. According to their public policies, "without these changes, bankrupt owners in all types of community associations will continue to avoid their assessment obligations whenever their units are vacant or occupied by people who do not pay rent – while all other association residents are left to pick up the tab.Without these changes, bankrupt owners in all types of community associations will continue to avoid their assessment obligations whenever their units are vacant or occupied by people who do not pay rent – while all other association residents are left to pick up the tab." Sound familiar? This is what SLH has been saying all along... the good association residents are picking up the tab of everyone else and that it is not fair. Most importantly and relevant to SLH's most recent activity, the CAI wants to eliminate the restrictions placed on assessments and want the board of directors to increase such assessments without approval of a vote from the owners! They believe such limitations are arbitrary; that they are unrealistic and unreasonable! I did not realize asking to take someone else's money was unreasonable!!! Their site also states that the "CAI opposes the enactment of governmental limitations on effective collection of assessments, fees and other charges of community associations. CAI supports laws strengthening such collection methods and lien rights by associations". They believe the laws stand in their way to collect from "calcitrant, delinquent owners" and the ability to have a "strong lien against the owner's unit". They also feel that assessments should not be "consumer debt". They do not want community associations governed by the Fair Debt Collections Practices. The law was enacted in 1979 to eliminate abusive practices in the collection of consumer debts, to promote fair debt collection and to provide consumers with an avenue for disputing and obtaining validation of debt information in order to ensure the information's accuracy. It also defined the consumers rights. Some of the restricted conducted defined by the act is the prohibition of the association to threat legal action for non payment of their assessments... The Association has threatened legal action against homeowners who do not pay them assessments and conforms with the CAI's philosophy. They also believe board members should be protected from poor decisions that they make and be shielded from liability and believe insurance should be considered a common expense. Why am I focusing heavily on Larsen & Associates and the CAI? For one reason - intent. This shows their motivation. Looking at their involvement with the numerous HOAs I had previously mentioned, liek McGarigal controlling the curb appeal of his neighbors, Larsen & Associates, too, found a a great gig rigging the system. Larsen & Associates had already done so previously with neighborhoods, such as the Lime Tree Village Club Association located in the Williamsburg development area, as well as from what I understand, Lake Ridge Village, too. A former board member for the Green Briar Village, also in Williamsburg, had spoken to Larsen to try to figure out how exactly Larsen converted voluntary associations to mandatory. According to this former board member, Larsen's response was "a gray area and as long as no one bucks it, there is no problem, but if someone does then there could be problems." Both Paul McGarigal and Larsen & Associates illustrate the conflicts of interests that real estate agents have when working in concert with homeowners association, as well as the blatant disregard for homeowners. To people like these, homeowners are nothing more then walking wallets, pawns, and they are the ones who want to pull the strings guaranteeing business is good.